Also bookmark this playlist on my youtube channel, it has all the videos for the pattern. 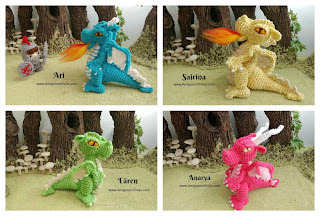 Out of that CAL many dragons were born and posted on my facebook page, Amigurumi Freely. I have had a number of people ask for name suggestions which brings us here, How To Name Your Dragon! My son, Jordan. He is a writer and comes up with the most creative names for his characters. Lucky for us he let me in on his secret for coming up with names! can be a color, or something unique about their feautures. Maybe it's the day of the birth or a personality trait. Think of the word for that then look that word up in another language. Try Elvish words or Hebrew or any language really. She is my pink dragon. I made her on a Sunday. I looked up Elvish days of the week thinking of the day she was born. My eyes fell upon the word for the 2nd day of the Elvish week, Anarya. The meaning behind that word is the sun. Sun-day. He is my blue dragon. I wrote stories about him here and think of the word brave when I speak of him. I looked up the word brave in different languages. The one I liked is in Hebrew, Ari. The meaning of that is lion or brave. He is my green dragon. I couldn't find anything for the word green that I liked but somehow that brought me to the Elvish word for ocean. Well, he's kind of a sea green color. I then imagined him flying over the oceans and the name Eären was perfect for him. She is my golden dragon. Oh my goodness, as soon as I made this dragon she reminded me of magic because she sparkles in the sun! I love her so much. Sairina is the Elvish word for magic. What will you name your dragon? 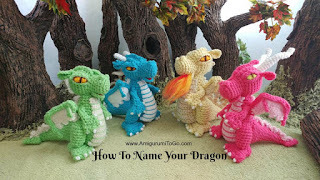 Now you have met my dragons and know how I named each one I hope it has given you ideas for naming yours. Once you've named your dragon, I'd love to hear about it! 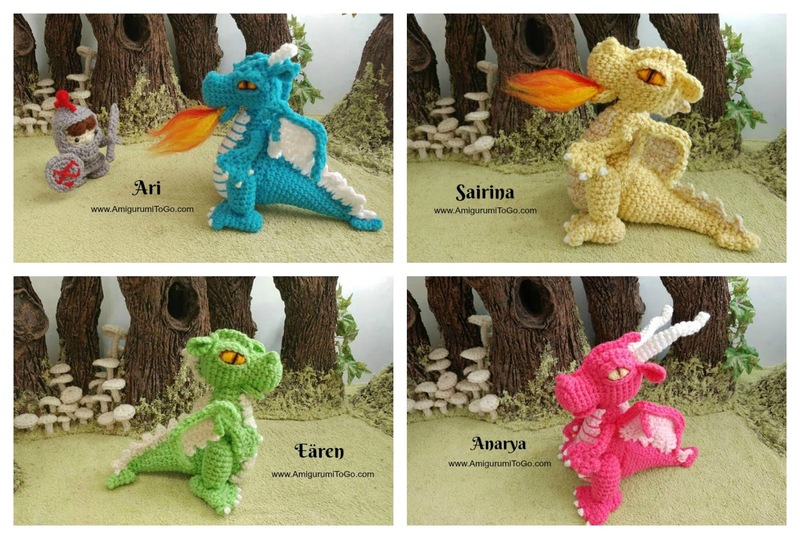 Post on my facebook page, Amigurumi Freely, and tell me how you came up with the name. If you don't have fb, feel free to leave a comment here, the only downside to that is you can't post a photo in blogger comments. I'd sure love to see a photo too! Thanks for stopping by, see you again super soon! Don't forget to subscribe to my youtube channel. I have many videos that go along with my crochet amigurumi patterns, and there's many more to come. Click the button to go to my channel.